Cyclic AMP Assays | Cell Biolabs, Inc.
Cyclic AMP (cAMP) is an important regulatory molecule in the GPCR signaling cascade. 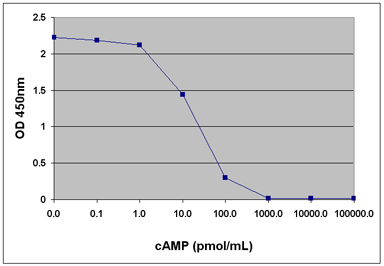 Our cAMP ELISA Kits provide a highly sensitive method to measure low levels of cyclic AMP in a variety of sample types. These cAMP assays deliver throughput, sensitivity and convenience for a superior user experience. Iyer, S.V. et al. (2016). Genome-wide RNAi screening identifies TMIGD3 isoform1 as a suppressor of NF-kB and osteosarcoma progression. Nat. Commun.7:13561. Zhao, W. et al. (2016). In silico modelling of novel drug ligands associated with abnormal tau phosphorylation: Implications for concussion associated tauopathy intervention. J Cell Biochem. doi:10.1002/jcb.25521 (#STA-501). He, T. et al. (2015). Role of prostacyclin signaling in endothelial production of soluble amyloid precursor protein-α in cerebral microvessels. J Cereb Blood Flow Metab. doi:10.1177/0271678X15618977 (#STA-501). Omosun, Y. et al. (2015). IL-10 modulates antigen presentation by dendritic cells through regulation of NLRP3 inflammasome assembly during Chlamydia infection. Infect Immun. doi:10.1128/IAI.00993-15 (#STA-501). Rose, S. J. et al. (2015). A new knock-in mouse model of l-DOPA-responsive dystonia. Brain. doi:10.1093/brain/awv212 (#STA-501). Liu, X. et al. (2015). β-Arrestin-biased signaling mediates memory reconsolidation. Proc Natl Acad Sci U S A. doi: 10.1073/pnas.1421758112 (#STA-501). Cortés, V. et al. (2015). Metabolic effects of cholecystectomy: gallbladder ablation increases basal metabolic rate through g-protein coupled bile acid receptor gpbar1-dependent mechanisms in mice. PLoS One. 10:e0118478 (#STA-501). Terunuma, M. et al. (2015). Purinergic receptor activation facilitates astrocytic GABAB receptor calcium signalling. Neuropharmacology. 88:74-81 (#STA-501). McRobie, H. R. et al. (2014). Agouti signalling protein is an inverse agonist to the wildtype and agonist to the melanic variant of the melanocortin-1 receptor in the grey squirrel (Sciurus carolinensis). FEBS Lett. 588:2335-2343 (#STA-501). Trehan, A. et al. (2014). 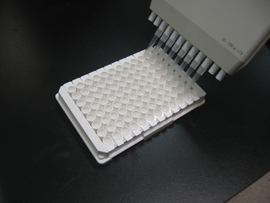 CANDLES, an assay for monitoring GPCR induced cAMP generation in cell cultures. Cell Commun Signal. 12:70 (#STA-501). Smith, E. P. et al. (2014). The role of β cell glucagon-like peptide-1 signaling in glucose regulation and response to diabetes drugs. Cell metab. 19:1050-1057 (#STA-501). Tian, L. et al. (2014). TSH stimulates the proliferation of vascular smooth muscle cells. Endocrine. 46:651-658 (#STA-501). Yong, Y. et al. (2014). Electromagnetic Fields Promote Osteogenesis of Rat Mesenchymal Stem Cells Through the PKA and ERK1/2 Pathways.J Tissue Eng Regen Med.doi: 10.1002/term.1864 (#STA-501). Jones, A. et al. (2014). Human Macrophage SCN5A Activates an Innate Immune Signaling Pathway for Antiviral Host Defense. J Biol Chem. 289:35326-35340 (#STA-501). Chen, X. et al. (2014). Identification of Serine 348 on the Apelin Receptor as a Novel Regulatory Phosphorylation Site in Apelin-13-induced G Protein-independent Biased Signaling. J Biol Chem. 289:31173-31187 (#STA-501). Peterson, J. R. et al. (2014). Treatment of Heterotopic Ossification through Remote ATP Hydrolysis. Sci Transl Med. 6:255ra132 (#STA-501). Rachmin, I. et al. (2014). Erbin is a negative modulator of cardiac hypertrophy. PNAS 111:5902-5907 (#STA-500). Meyer, R et al. (2013). GPR37 and GPR37L1 are Receptors for the Neuroprotective and Glioprotective Factors Prosaptide and Prosaposin. PNAS. 10.1073-PNAS.1219004110 (#STA-500). Sun, Z. et al. (2011). The WD40 Repeat Protein WDR26 Binds Gßγ and Promotes Gßγ-dependent Signal Transduction and Leukocyte Migration. J. Biol. Chem. 286:-43902-43912. (#STA-500). Chen, M. et al. (2010). Involvement of cAMP in nerve growth factor-triggered p35/Cdk5 activation and differentiation in PC12 cells. Am J. Physiol Cell Physiol. 299:C516-C527. (#STA-500). Israeli, M. et al. (2016). A simple luminescent adenylate-cyclase functional assay for evaluation of Bacillus anthracis edema factor activity. Toxins. 8:243 (#STA-501). Liu, L. et al. (2014). PKCβII acts downstream of chemoattractant receptors and mTORC2 to regulate cAMP production and myosin II activity in neutrophils. Mol Biol Cell. 25:1446-1457 (#STA-501). Liu, L. et al. (2012). Radil Controls Neutrophil Adhesion and Motility through β2-Integrin Activation. Mol. Biol. Cell. 23:4751-4765 (#STA-501).